Shisaku: Care To Try Governing For A Little While, Mr. Abe? Care To Try Governing For A Little While, Mr. Abe? What? Revision of Article 96, lowering the threshold for constitutional amendment below the current 2/3rds of both houses of the Diet standard? Opening the door for a gusher of revisions, including ones with the sole purpose of extending LDP rule non erit finis? 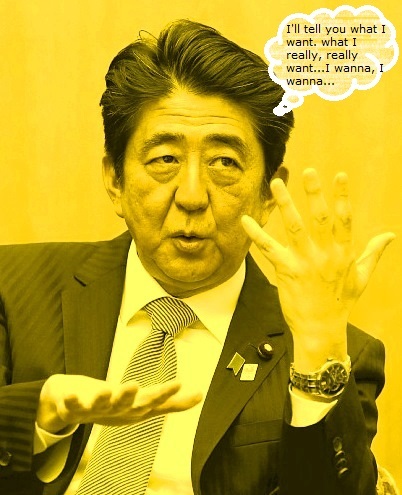 Abe enjoys a supermajority in the House of Representatives, meaning that right now he and his party can pass any legislation that the New Komeito can be stiff-armed into accepting. Come August, even this restraint will be removed, as barring an unimaginable catastrophe, the LDP will have robust majorities in both the House of Representatives and House of Councillors. Abe can look Yamaguchi Natsuo in the eye and say, "If you do not like my policies, then vaya con Dios, mi amigo." The New Komeito for its part will likely not leave the ruling coalition, partly because breaking with the LDP would open up the possibility the government looking into the activities of NK's mother ship, the Soka Gakkai. Whether or not the New Komeito stays or goes (and Abe & Company will be smart enough to make sure that a break up looks like the New Komeito jumping rather than getting pushed) Abe and the LDP will have no effective constitutional or coalition partner brakes upon their legislative agenda. With essentially total control in his grasp and the only threat on the horizon the remote one of the Supreme Court invalidating the 2012 House of Representatives election (Link) Abe sees his primary duty to be…constitutional revision? Well, of course we know “why” in the sense of a legacy or mission, as both the LDP and Abe have pledged since the beginnings of their respective existences to rid the country of this constitution drafted by New Deal idealism-inspired staff members of the Occupation. "Why do you need to fiddle around with the Constitution, when you have tyrannical legislative and executive powers? Why not use your constitutional powers and your current popularity to govern the country, seeing as how you do not have to pay the least bit of attention to us at all? The Constitution is not blocking you from running the country as you see fit – only your own timidity and sloth are." It is a mark of the intellectual and ethical vacuity of the LDP that when it possesses the ability to do anything except mess with the constitution, it wastes its energy on trying to mess with the constitution. The reason for this pointless obsession with constitutional revision? Oh, Abe & Company (and the Hallelujah Choruses inside Japan’s news media universe and the Washington DC nomenklatura) will give you a list of reasons a kilometer long. The actual reason, though? Governing a country is work…and who wants to do work when agitation and propaganda opportunities beckon? 3. it is time for the Japanese people to come up with their own constitution. Do these three reasons simply sum up to just one: "getting rid of a constitution drafted by New Deal idealism-inspired staff members of the Occupation"?